For the past six years our company has hosted a Truck Driving Championship (TDC) style driving competition and raised money for the Pediatric Brain Tumor Foundation – Georgia Chapter. Improving safety skills and helping children suffering the horror of brain tumors and cancer are our goals. In the past four years alone we raised about $55,500. Last year’s competition alone drew in over 124 drivers from 21 states and raised a total of $25,500 for the Pediatric Brain Tumor Foundation!! This year, we are once again proud to sponsor this competition and it will again be open to ALL DRIVERS from ALL COMPANIES!!! 1. Get new drivers involved in TDCs. 2. Give veteran TDC competitors a way to tune up their skills before the State TDC season kicks off. 3. Promote the reality that the trucking industry is serious about safety and actively seeks to improve driving skills and performance. 4. Most importantly, we are raising money to help children suffering from the horror of brain tumors and brain cancer. A $50 donation is due at time of registration. You can donate more if you would like. Drivers will need to registration online before Feb. 23th to receive a commemorative T-Shirt!!!! The Safety Drive for a Cure event gives you an opportunity to drive a world class course, take a well-prepared written test, perform a vehicle inspection and donate to a great cause. Once you have the number “1” for the number competing, you can click “BUY TICKET”. After clicking the “BUY TICKET” button the official REGISTRATION screen (shown below) will come up that you will need to fill out about yourself to officially register. 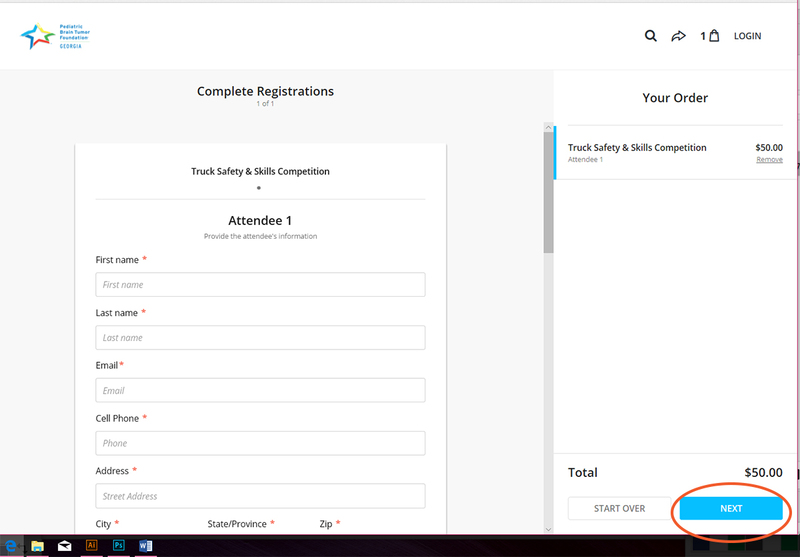 Once you have the Attendee information filled out, click the “NEXT” button to continue registering. After clicking the NEXT button, a screen will come up asking if you would like to make an additional donation over your $50.00 registration fee. If you do not wish to, click the “SKIP” button. 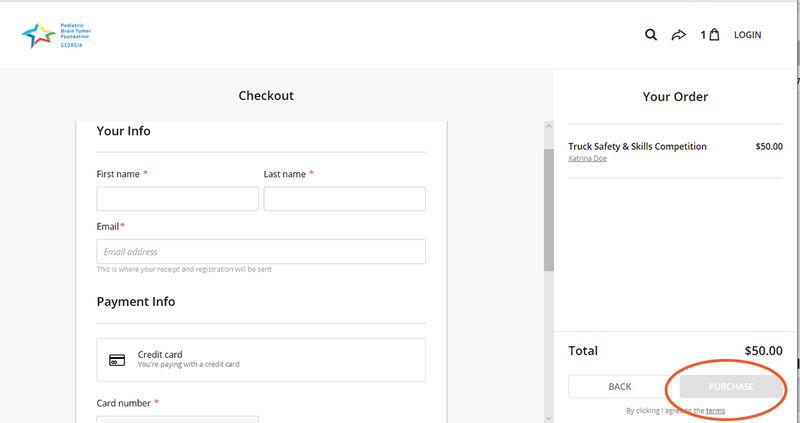 After clicking the “SKIP” button, the final screen for checking out and purchasing will come up. Payment is due via credit/debit card at time of registration.